a lily among thorns: how could God ask that? how could God ask that? Happy Monday! I was going to blog on being still when my friend Chris sent me this email. I was blown away by it and how timely it was. Enjoy and may you find rest and hope in Christ today and always. Many of us have struggled to understand what seems like an outrageous request. And it is not only this command to Abraham that confounds us. 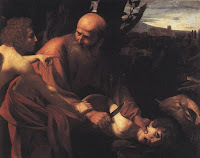 We also read about Jacob’s wrestling in the dark with God throughout the night until finally God wrenched his hip, leaving him with a limp, and we wonder why God would do that. We read about God telling Hosea to marry a prostitute, to have children with her, and eventually to buy her back from the slave market even though she is already his, and we think we can hear Hosea’s heart breaking. We read about God telling Jonah to go to Nineveh to call Israel’s enemies to repentance, and when we get the full picture that these are the Assyrians who have slaughtered Jonah’s fellow Israelites and hauled them off to concentration camps, we think this is simply too much to ask of any man. We are a bit offended on their behalf. How could God ask this of them? And we’re also a bit afraid. Might God ask something like this of me? Perhaps we’re meant to feel a bit appalled. Perhaps it is not until we feel a sense of outrage over these seemingly unfair requests that we can be prepared to feel an appropriate sense of wonder when we begin to see what we’re meant to see in these difficult-to-swallow scenarios. When we begin to see what God intends for us to see, our outrage gives way to adoration, consternation gives way to worship, and horror melts into humility before a God who, rather than asking the unthinkable of us, has done the unimaginable for us. Why would God ask Abraham to offer his son as a sacrifice? Is God trying to teach us that we should be willing sacrifice what is most precious to us? No. This story is not recorded to inspire sacrifice to God. Instead, it paints in vivid colors the sacrifice of God. The point of this story is not to convince you that you must be willing to sacrifice to God what is most precious to you, but rather to prepare you to take in the magnitude of the gift when you see that God was willing to sacrifice what was most precious to him—his own beloved Son—for you. When we read the story of Jacob and see him walking away with a limp, we’re not meant to assume that God intends for us to suffer this way if we want to experience his blessing. Jacob, who wrested in the dark to gain a blessing for himself, points us to One greater than Jacob who wrestled in the dark of Gethsemane and was crushed by death itself so that he might gain a blessing for us. When we read the story of Hosea, we need not fear that God might call us to marry an unfaithful spouse just to make a point through our misery. Instead, we’re meant to see that Jesus will join himself to an unfaithful wife—you and me—and make us his pure bride. He will go to the slave market of sin and buy us back at the cost of his own blood. And when we read the story of Jonah and see him sent to people he has every right to hate because of who they are and what they’ve done, we’re not meant to assume that God is going to require this of us, but rather that he will require it of himself. Jesus will leave heaven to go to a people who deserve to be treated with contempt because of who they are and what they’ve done, yet he will show them grace. He will not be sad when they repent, but will, instead, shed tears over their refusal to repent. If we read the Bible assuming that we are expected to follow in the footsteps of those who are featured in its pages, we will find ourselves always trying harder to sacrifice and obey but never measuring up. We’ll assume that God asks us to do things that will make us miserable just to put us through a test of our allegiance—diminishing, rather than magnifying God in our hearts. But when we read the Bible recognizing that it is not about what we must do for him, but about what he has done for us through Christ, rather than being offended by what we fear he may ask of us, we find rest in what he has done for us.